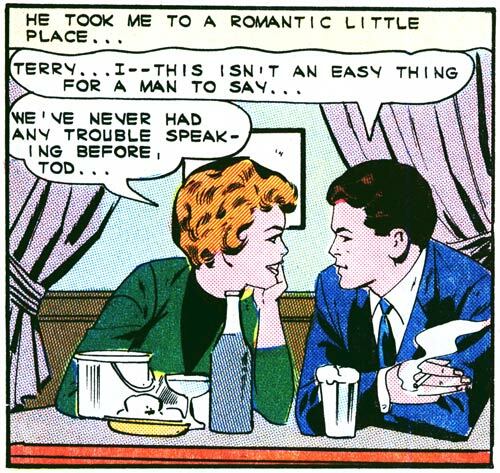 Art by the Vince Colletta Studio from the story “Symphony of Love” in FIRST KISS #39, 1964. TERRY: Go ahead, Tod! Don’t be shy! Ask me to marry you! TOD: Maybe later—if we ever go on another date. For now, I was just wondering…would you pay my bar tab? This is hard for a man to say but, here goes. She sells she shells by the she shore…oh, dang these store-bought teeth.